Triglav is not only Slovenia&apos;s highest mountain but it is also a national symbol featured in our flag. A stylized depiction of Triglav&apos;s distinctive shape is the central element of the Slovene coat of arms, designed by the sculptor Marko Pogacnik. There are a number of different clubs called Triglav and some would say you are not a true Slovene if you have not been on the mountain yet. The origin of the name Triglav (three headed) is not perfectly clear. From most sides of the mountain, you can only see two heads; maybe the view from Bohinj could be seen as a three headed mountain. Another possibility is that the name comes from a three headed Slavic god of war called Triglav. Climbers and explorers began to tackle Triglav Mountain in the second half of the 18th century, and in 1778 it was conquered successfully by four local men from Bohinj; Luka Korošec, Matevž Kos, Štefan Rožic and Lovrenc Willomitzer. One of the key figures in the development of mountaineering in Slovenia was a priest from Dovje village called Jakob Aljaž. He bought the land on top of Triglav at the end of the 19th century and commissioned the building of a tower right on top of the mountain as a shelter. The tower still stands today and is now called Aljaž&apos;s tower. When Aljaž bought the top of Triglav and built the tower, this led to a huge legal battle with German based organisations who claimed that he destroyed a triangular point (Slovenia was then part of Habsburg monarchy). After he won in the court he donated the top to a Slovene mountaineering organisation. The ascent to Triglav is no joke. No matter which starting point you choose, the route will be long and in the upper part very exposed, full of temples and steel cables. Just below the summit there are 4 mountain huts, (Triglavski dom na Kredarici, Dom Valentina Stanica, Dom Planika and Koca na Dolicu). Paths that lead up to them from various starting points (except from Vrata valley) are mostly technically simple whereas the upper part demands more mountaineering experience and a careful step. 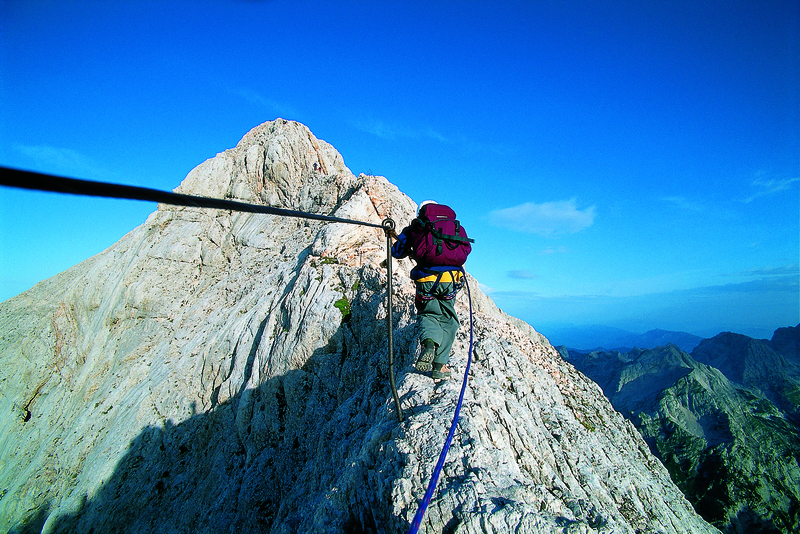 Despite the difficulty of the ascent, Triglav is a very popular summit in all seasons. In 2017 we will begin to offer our guests a one day ascent of Triglav in collaboration with an experienced mountain guide Igor Kremser. We can arrange a trip on our free day (Wednesday) for fitter guests.